Beach Retreat is tucked away in a peaceful, secluded location, just 300 metres from the unspoilt sandy beaches of Sutton-on-Sea. 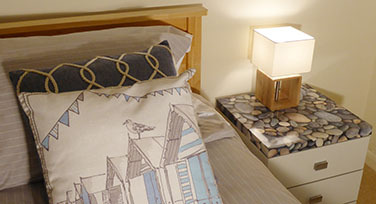 It's the perfect escape with a young family, a getaway for friends or a romantic retreat for couples of any age looking for a quiet and comfortable base from which to explore the east coast and the lovely Lincolnshire Wolds. This charming, well-equipped seaside self-catering accommodation has private off-road parking and a delightful, fully-enclosed rear garden for guests to enjoy a relaxing break. We stayed here with our 2 year old and 2 month old for a few nights in July 2015. The owners couldn't have been more accommodating with our requests for alternative arrival and leaving dates. The house is lovely, felt spacious (even with the baggage that comes with 2 kids!) and had everything that we needed. It's really close to the beach and a lovely little park and lido for children. Hoping to go back sometime in the future! We have just returned from an excellent week at this stunning property and are already looking forward to going again. The photos truly represent the accommodation and its facilities. It is a spacious, clean and very comfortable cottage. The provision of children's books and games was a nice touch, as was the welcome pack: very thoughtful! We were greeted by the owner on arrival who showed us the various 'need to know' stuff. Despite arriving a little late she was incredibly welcoming. I cannot recommend this delightful place highly enough. I am very fussy, too! Thank you for a great stay. This is a wonderful cottage, you will not want to go home. Everything you could possibly need is available even down to tiny hangars for children's clothing! Spotlessly clean, beautifully furnished in a very quiet spot with a sun trap front garden. 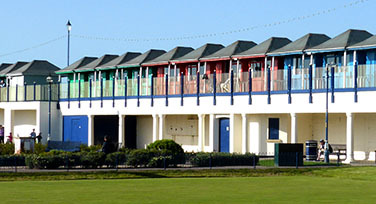 Only a few minutes walk from the seafront which leads to lovely gardens, paddling pool, cafe and the local shops. Melissa, the owner is very friendly and met us at the door. A truly superb place to stay. Well positioned close to the beach and town. Very quiet location. A much appreciated welcome pack. Very clean. A fantastic property in a lovely location. We booked this last minute and were not disappointed. The property is spotless and the welcome pack was a lovely touch. Spacious enough for our family of 4. Particularly enjoyed relaxing in the conservatory...very peaceful. Would definitely recommend. Thanks Melissa for a lovely stay. We stayed for a week at the end of May and had a fantastic time. There were 4 adults and there was plenty of space. The bungalow is in a lovely quiet setting, very convenient for the shops and beach. The bungalow has all the amenities you need and the kitchen was very well equipped. The beds were very comfortable and the bedding and towels etc that were all supplied were lovely. We forgot to take reading books with us but the bookshelf with books, games etc was a nice surprise. The wi-fi/internet signal was excellent. I would recommend it all to everyone. Beach Retreat was a wonderful place to stay. The bungalow was comfortable, spotless and had so many extra touches - a welcome basket, picnic set, washing line, books and games, wifi, a dishwasher. It really was home from home, and was so closer to the beach. We had glorious weather so spent lots of time on the beach, at the children's paddling pool, and also walked to Mablethorpe. We visited the Seal Sanctuary and Donkey Sanctuary nearby too. 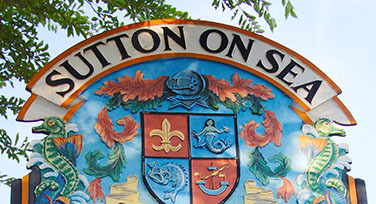 Sutton on Sea is a very peaceful and friendly place. We will definitely be back. Very good communication with the owner, Mellissa met us when we arrived, and took us through all the information we needed to operate, heating wifi ect. A home from home, exceptionally clean, would recommend to everyone. The area is very quiet, an excellent fish and chip shop in the high street eat in or take away, our three day stay when too quickly. Only a short walk from beach so the name is appropriate. We had a lovely stay here. Close to the beach and good paved walkway all the way to Sutton-on-Sea. The children loved riding their bikes along the sea front. The bungalow is warm and welcoming with everything you could need. Spotlessly clean, with really comfy beds. We definitely plan to stay again. Beach Retreat far exceeded our expectations. The accommodation was perfect for family with older kids like ours, but equally perfect for young families too. Our every need was catered for and the Welcome Basket was a pleasant surprise. Would highly recommend the location as minutes from the front door is a sandy, clean beach. There are lots of points of interests within an easy drive. But we chose to relax and enjoy the house, beach and local cuisine. A first class place to stay with a lot of thought put in by the owners to make Beach Retreat that little bit special. We spent our days out knowing that in the evening we would be returning to the peace of this gem. A walk along the beach, a drink in the garden and relaxation. What more could we have wished for? Our first time self catering and to be honest, we hardly used any of the equipment on offer, except the kettle in the morning, but it had everything you may need and that helped the whole experience go well. Even the neighbour had a kind word for us one evening. Top marks!